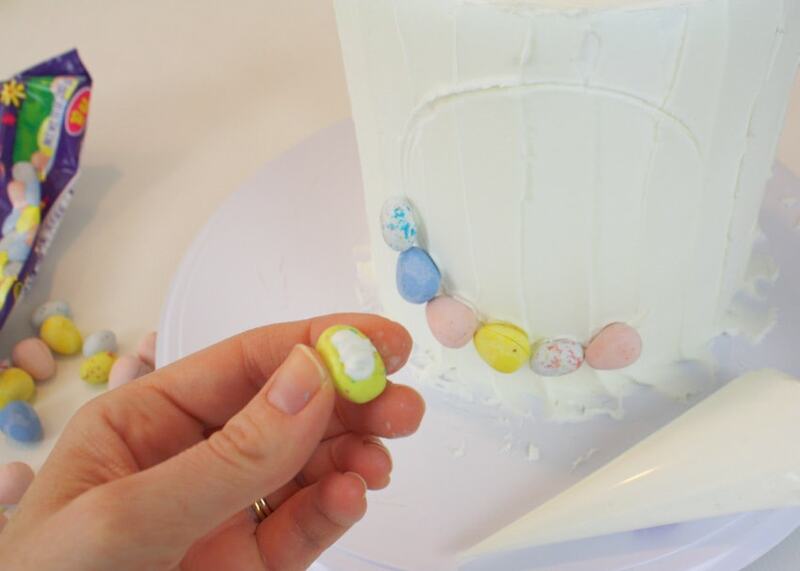 Today I’m going to show you how to make an adorable, simple, Easter wreath cake! 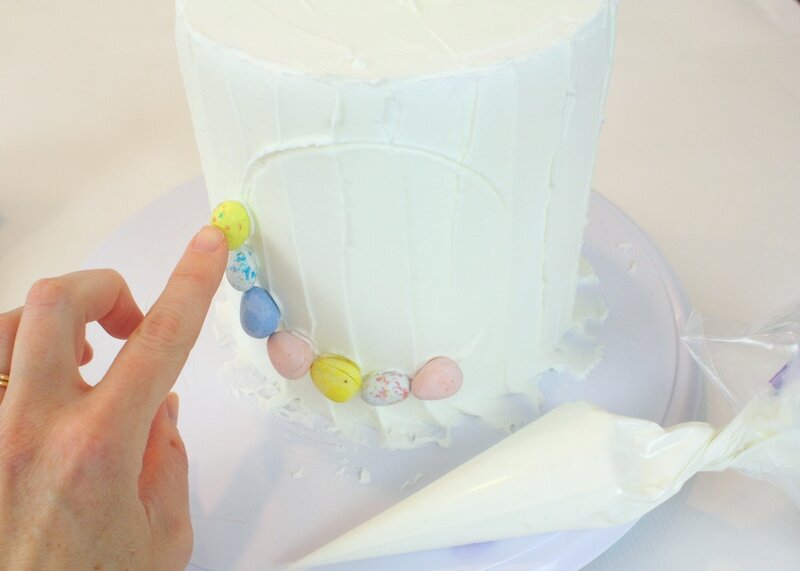 Every year, I look for ways to incorporate malted milk egg candies into my Easter decorating. 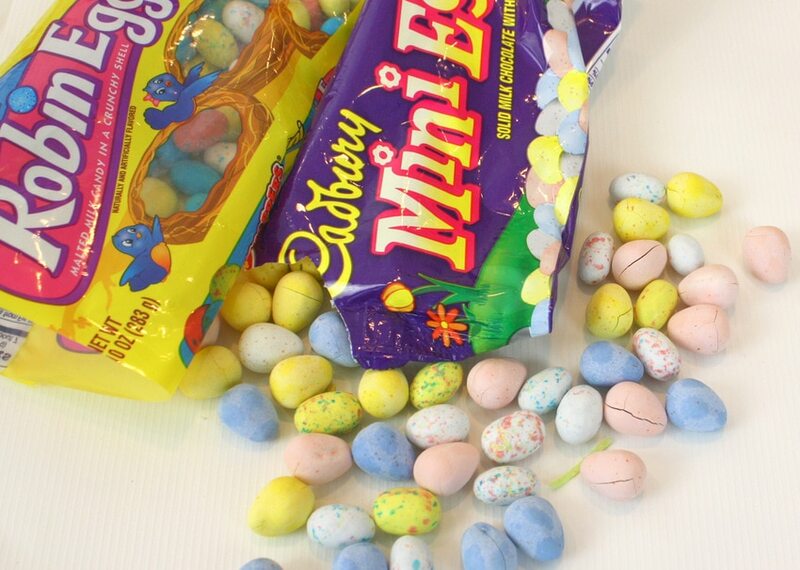 I love their speckled chocolate shells, the pretty matte colors, and I love to eat the leftovers!! 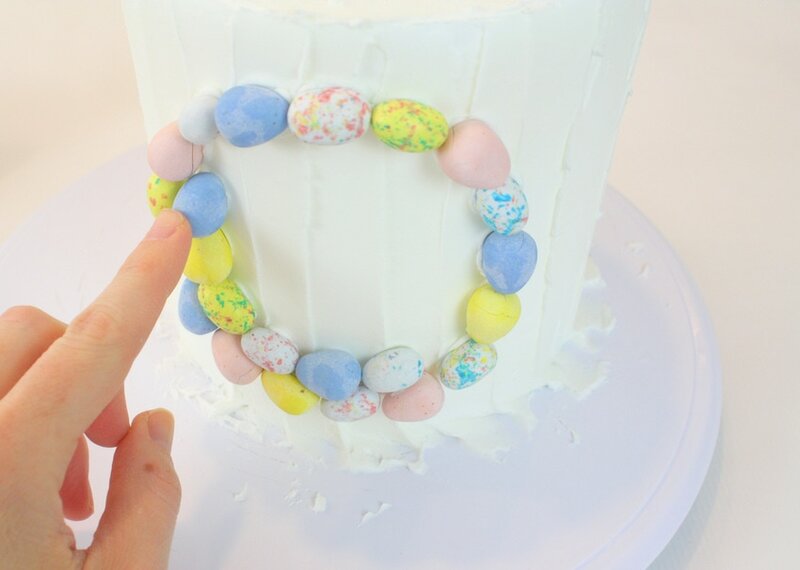 Last week, I bought a colorful Easter egg wreath for our front door…and then it dawned on me that a candy Easter egg wreath would make the perfect decoration for a tall, buttercream frosted cake! Hooray! 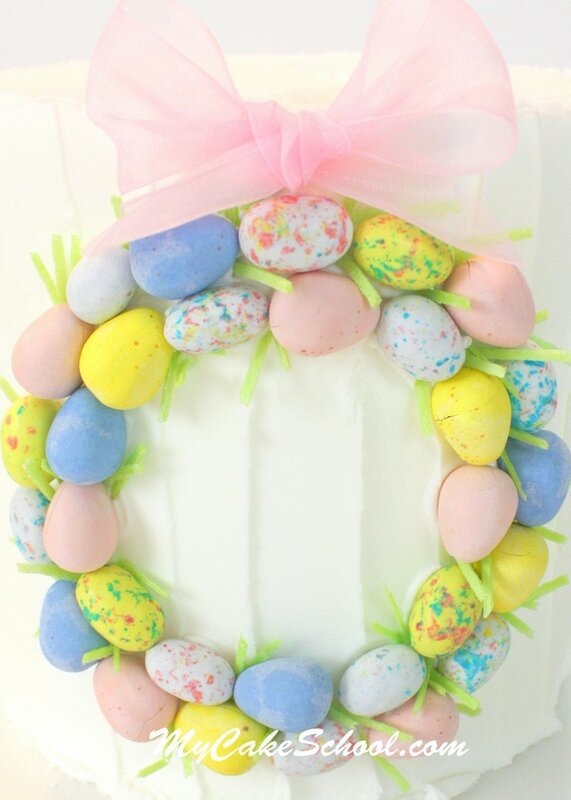 So, this year, my malted milk egg candy decorations are coming to you in the form of an Easter wreath. It comes together in minutes, and the final look has a country chic feel. I hope that you enjoy it! First, I frosted a tall (double barrel–6 inches tall & wide) cake with vanilla buttercream. I created a textured look with vertical strokes, moving my tapered spatula from bottom to top, scraping off my spatula after each pass. 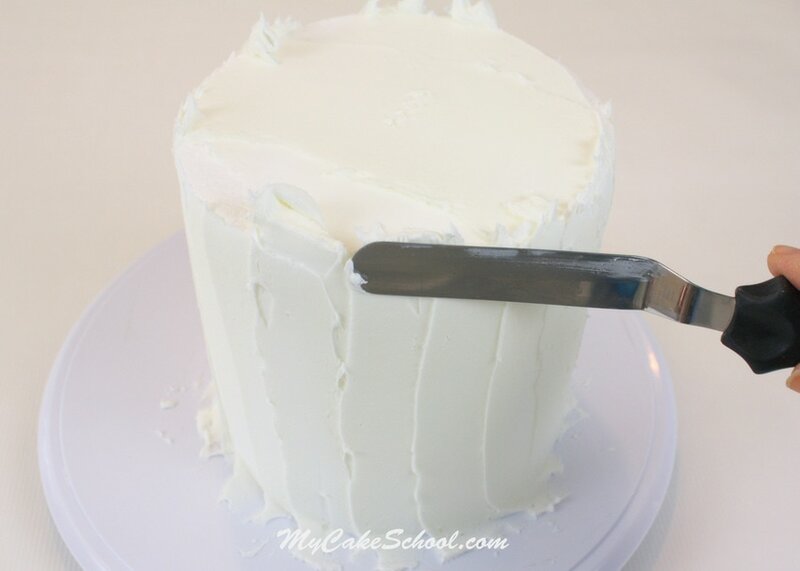 Then, as usual, I spread the excess icing away from the edge, and smoothed toward the center of the cake. Next, I used a 4 inch circle cutter to mark my circle. If you don’t have a circle cutter that will work, look for things around the house…a glass, a plastic cup, etc. By the time I had picked out the colors that I wanted for my wreath,my crusting buttercream had crusted over. So, I filled a piping bag with more buttercream, snipped the end, and piped buttercream onto the back of each egg. After completing the first row of eggs, I decided to make another row. You can see how I staggered my second row of eggs to fit as snugly as possible into the first. After finishing with the egg placement (isn’t it cute? 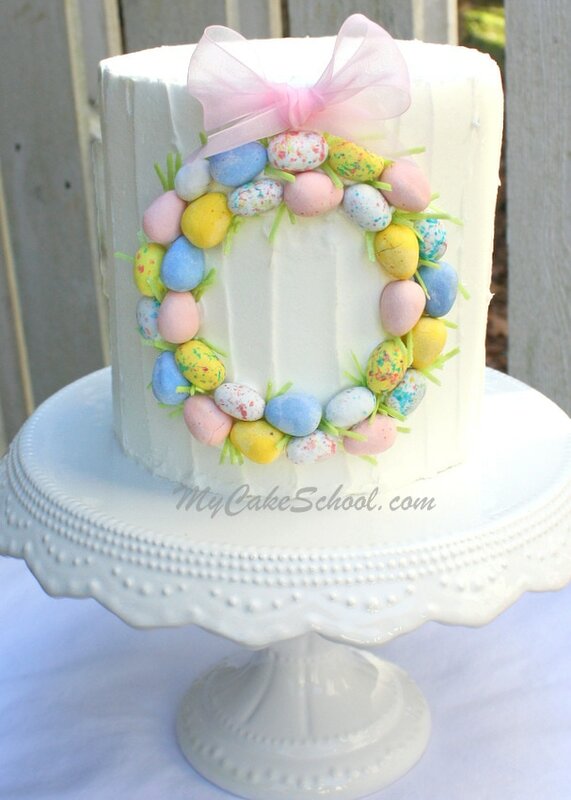 ), I snipped my edible Easter grass into little sprigs and placed here and there into my wreath. 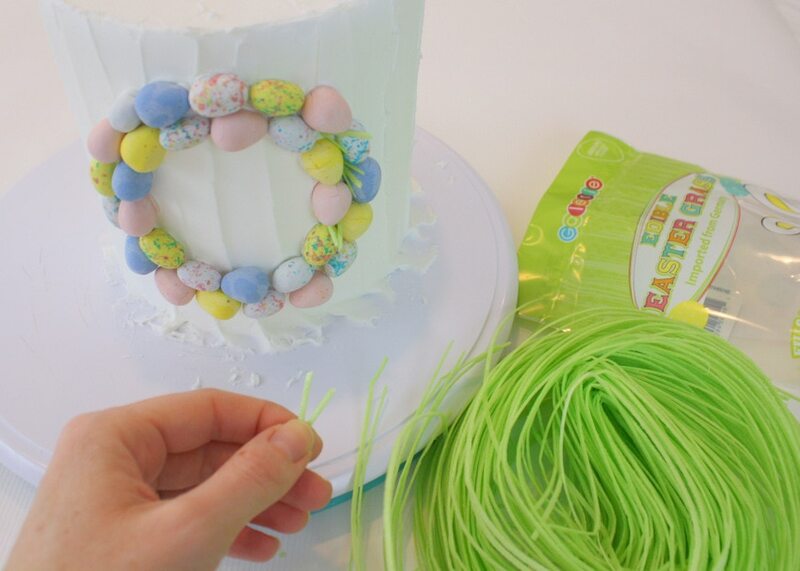 I’ve seen Edible Easter grass as Target and my local grocery store….but if you have trouble finding it, the wreath would be just as cute without it, or even with a few sprigs of piped buttercream grass. And that’s all there is to it! Sometimes simple is better, don’t you think? I hope that you enjoyed the tutorial, thank you for stopping by! Looking for more Easter cuteness? 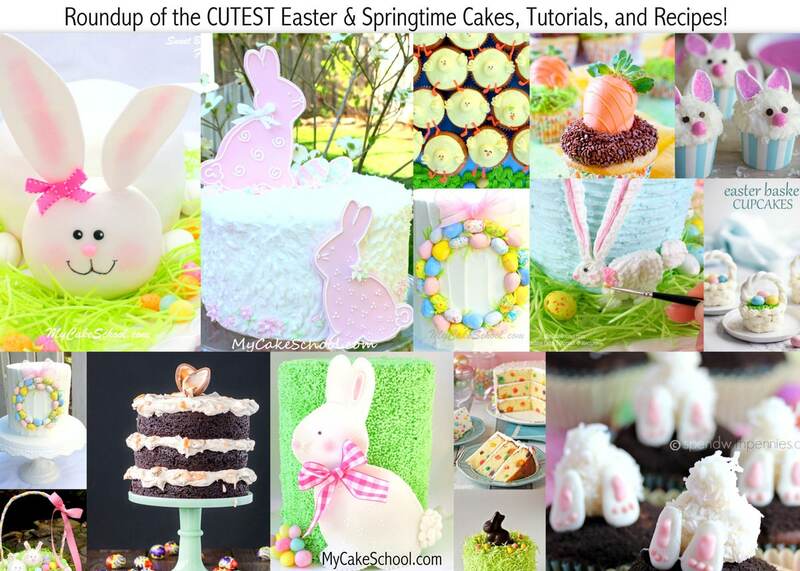 Check out our Roundup of the BEST Easter & Springtime Cakes, Tutorials, and Ideas! I think this is pretty but I may try it iced in a pastel yellow or pink. @Melissa– We almost went with a pastel pink frosting…I think that would be pretty too! If you try, we’d love to see! Such an adorable cake, and I think I can do it! :) Thanks, Melissa! I love this idea. I think this might be our Easter cake. Awesome as always Melissa! Melissa, beautiful as usual! Simple and elegant at the same time. Love it! Too gorgeous! I can’t wait to try this for Easter. I love this, as always! Thank you for another beautiful and simple design. So cute, Melissa! And yes, sometimes less is more. You always have the sweetest ideas! I made your Easter bunny cake last year and everyone loved it! I am going to do this for a tennis luncheon – my teammates will go crazy!! Thanks!! @Freda- This is just a basic crusting American buttercream recipe but with part shortening/part butter. (Our “fluffy” recipe if you are a member of our site) — The more shortening a frosting recipe contains (in place of butter), the more heat resistant it will be. However, you do lose some of the flavor when substituting shortening in place of butter, so be sure to compensate with additional flavorings! So creative! I love it!!! Cannot wait to try this out for Easter!! Thank you for ALL your tutorials! 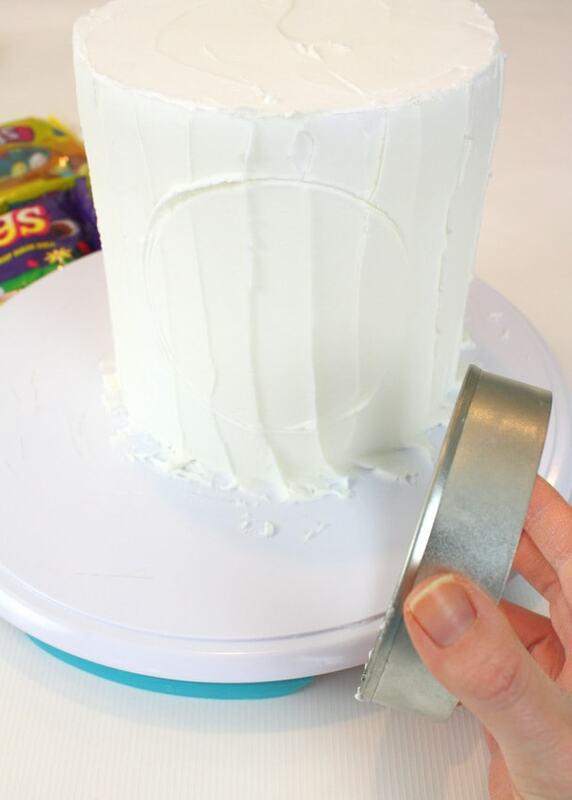 Would a 4 inch round cookie cutter still work if I use only 3 layers of cake? 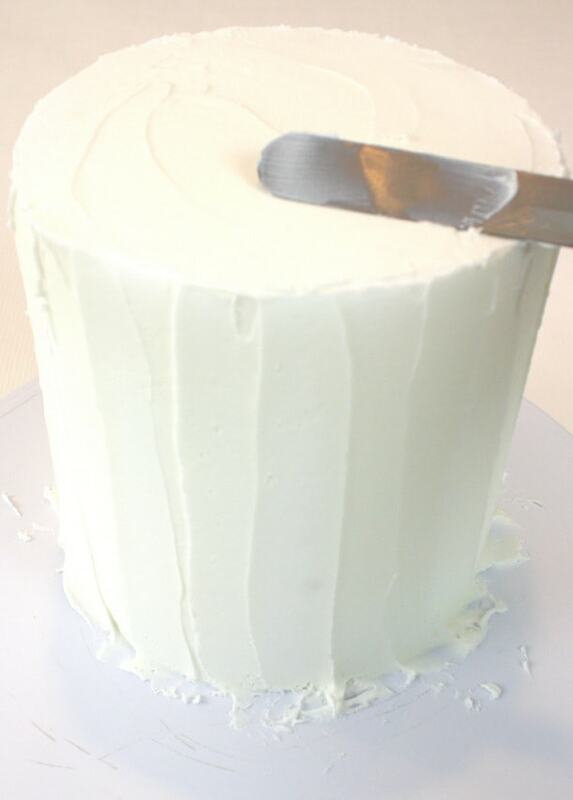 I don’t have the board or straws to make a double barrel cake. Instead of using a circle cutter/template for the outer edge of the wreath, another option is to instead use a small circle as a guide for the inner circle, and then build around that. Thanks for your response. I tried making the cake today, but couldn’t get the eggs to stay on the cake (even when I put frosting on the eggs they kept falling off). So I just gave up and put the wreath on top of the cake, which worked, but I think it’s cuter to have the wreath on the side of the cake. Thanks for the tutorial anyway. Still a super cute idea! Oh no! I’m sorry that your eggs wouldn’t stick….I wonder if yours were larger than mine (heavier) or maybe a softer frosting? I’m glad that you made the wreath on top as your Plan B! Mom and I actually talked about how that would have been a good option too after posting the tutorial. I’m sure it is really cute! Happy Easter!